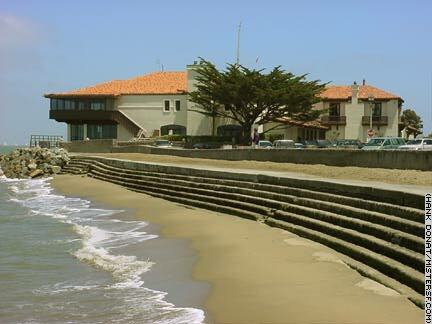 St. Francis Yacht Club, 700 Marina Blvd. Detail II Jack Lemmon and Lee Remick progress from social drinkers living in a nice apartment at 1800 Pacific Avenue in Pacific Heights to gin soaked sots with nothing more to lose in Blake Edwards' 1962 drama Days of Wine and Roses. Lemmon is a public relations executive who meets Remick, his client's secretary, at the St. Francis Yacht Club. The big screen treatment of themes familiar to contemporary television audiences stands the test of time due to great performances and an ending that's neither pat nor overly optimistic. The Alcoholics Anonymous message is carried in the proper context of the story and without the pedantic, pamphlet-like tone often taken by films about alcoholism or alcoholics. City locations create a genuine sense of place that fosters the film's social realism. Edwards' Experiment in Terror, which also stars Remick, was released the same year.